Good Garage Scheme Car Servicing in Great Britain : Good Garage Scheme’s iPhone app appears in Sunday Times article and is downloaded over 700 times! 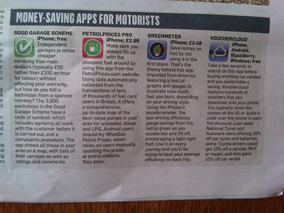 Good Garage Scheme’s iPhone app appears in Sunday Times article and is downloaded over 700 times! The Sunday Times newspaper on 10th July contained a two-page article in its Ingear section about how families are being required to economise on their motoring costs and are giving up the luxury of a second car. The article highlighted a typical two-car family that reassessed their finances and realised they could make do with one car and thus eliminated half the costs of tax, insurance and fuel in one go. As a further benefit to consumers looking to save money on motoring costs, the article listed four money saving “apps” under a section entitled, “Money-Saving Apps for Motorists”. The Good Garage Scheme’s iPhone app was highlighted as the first of four recommended choices. The free Good Garage Scheme iPhone app was recommended for motorists hoping to locate an independent local garage and offering a significant saving to that of a main dealer. The Good Garage Scheme member will follow a Code of Conduct and also offers a complaints procedure. The app, launched by the Good Garage Scheme in January 2011, is a useful tool for motorists that incur car problems while out and about with their vehicle. 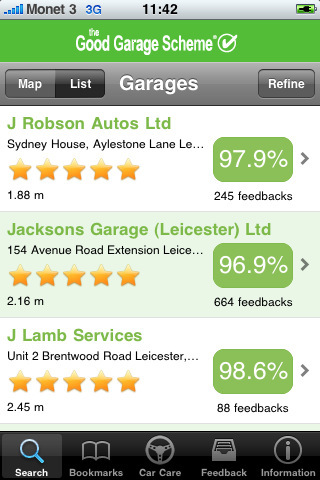 It enables the user to access either a map or a list of the nearest Good Garage Scheme members plus contact details, feedback and star ratings for each of those garages shown. Car care tips such as how to check the oil are also available within the app. Please click here to find out more and download the app.